»Mumbai To Igatpuri – A Meeting With Self! Mumbai To Igatpuri – A Meeting With Self! Mother Nature has a lot to reveal to us. You will experience this once you land up in Igatpuri. This picturesque destination is about 120 km from Mumbai. Surrounded by highest peaks in Sahyadri, i.e., the Western Ghats, this hill station is the Place to be for hikers. Those intending to seek solitude can also visit Igatpuri and devote themselves completely to meditation. The Internationally recognized Centre for Meditation named Dhamma Giri is one of the largest Vipassana Centres in the world. This ancient meditation exercise, Vipassana, will not just help you find your inner self but will also change your outlook towards life. Igatpuri is well connected by roadways and railways. Historic ruins of certain forts mark the importance of Satavahana dynasty. Apart from trekking, activities like rappelling and rock climbing are also performed here. Bollywood directors and producers have shot various songs in Igatpuri. If you choose monsoons to travel in and around Maharashtra, then this is a place to be during this time of the year! The grass gets greener, forests become denser and waterfalls get deeper when rains hit this region, making the tourists feel like paradise on earth! 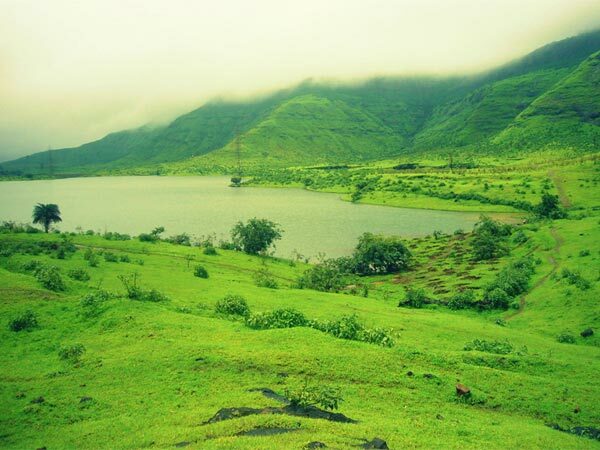 Monsoons are apt to visit Igatpuri for trekkers and nature lovers. June to September are the months where Igatpuri experiences good rainfall turning the surroundings into a happy place. Summer visits can be avoided. Winters (November to March) is one of the best seasons to visit Igatpuri. How To Get To Igatpuri? Route 1 is recommended. By opting Route 1, you will reach Igatpuri in roughly about 3 hours. Route 2 will take you approximately 4 hours. By Rail: Frequency of trains between Mumbai and Igatpuri is quite high. The travel time is 2-3 hours. Refer this table to get the train schedules, timings, etc., originating from and passing via Mumbai. By Bus: Many people prefer travelling by bus to Igatpuri because they do not want to tire themselves by driving, plus they intend to enjoy the scenic views without any disruptions. The bus tickets range between Rs 450/- and Rs 480/- per person. At least 1 bus runs daily from Mumbai to Igatpuri. Pack your bags. Leave with an empty stomach. Start early. About 25 km from Mumbai, hog on to the famous spicy Misal Pav at Mamledar Misal at Thane. This typical Maharashtrian cuisine is worth relishing. Popularly known as City of Lakes amongst its residents, Thane boasts of having around 33 lakes within the city. Don't miss Upvan Lake to witness nature's marvel! Shahapur stands about 53 km from Thane. Manas Mandir is a magnificent Jain temple which will leave you spell bound. It is the most visited Jain temple in this area. Shahapur is a host to a lot of day picnics and homestays. About 49 km from Shahapur, IGATPURI arrives! Keep all your senses active while on your drive, so that you don't miss the beauty that your surroundings have to offer! Located on the banks of the Bhatsa river, this valley is a stopover just before you enter the main town of Igatpuri. Surrounded by impenetrable dense forests, river gushing beneath, smoky weather amidst the woods, Bhatsa valley is one of the most beautiful attractions in Igatpuri. Do visit the temple of the goddess of Ghats, i.e., Ghatandevi Mandir, situated in this valley. Overnight camping is ideal for corporate gatherings, family get-togethers and group of friends. Campfire with music, bird watching, star gazing, board games, etc., are some activities that will fascinate you during your stay here! All you photo fanatics should not miss stepping in to the Camel Valley. The valley will introduce you to a thunderous waterfall, where water flows down from a height of about 1000 ft. Camel valley is a must visit during monsoon! At an altitude of 3000 ft above sea level, the height of the Tringalwadi Fort with its scenic views attracts innumerable trekkers. Walk your way into this mystic land and worship Hanuman at the entrance gate. History buffs will have a great fun watching the age-old architectural ruins here for sure. If you have more than 1-2 days to spare, then the Kalsubai Peak (1646 meters, 5400 ft above sea level) is a dream come true for ardent trekking enthusiasts. It bags the title of being one of the highest peaks in Maharashtra. More so, the base village, Bari, from where the trek commences is just 30 km away from Igatpuri. There is no feat as heavenly as reaching the top. At the end of the Kalsubai summit, you will certainly have a feeling of victory! Enroll yourself for a ten-day Vipassana course at Dhamma Giri Meditation Centre and just elope to Igatpuri. Religion, caste and creed are irrelevant for anyone who wants to be a part of the course. All you have got to do is, be dedicated, learn to focus on your breathing patterns and be acceptable to change! The catch is, you have to remain silent till you complete your course and you won't be allowed to interact with your folks. So, no technology, no family, no friends, no phone, no social media...it's just you and nature!